Mobile social media refers to the combination of mobile devices and social media. This is a group of mobile marketing applications that allow the creation and exchange of user-generated content. Space-locators: Exchange of messages, with the relevance of one specific location, which are tagged to a certain place and read later by others. Quick-timers: Transfer of traditional social media applications to mobile devices to increase the posting of Twitter messages or Facebook status updates. 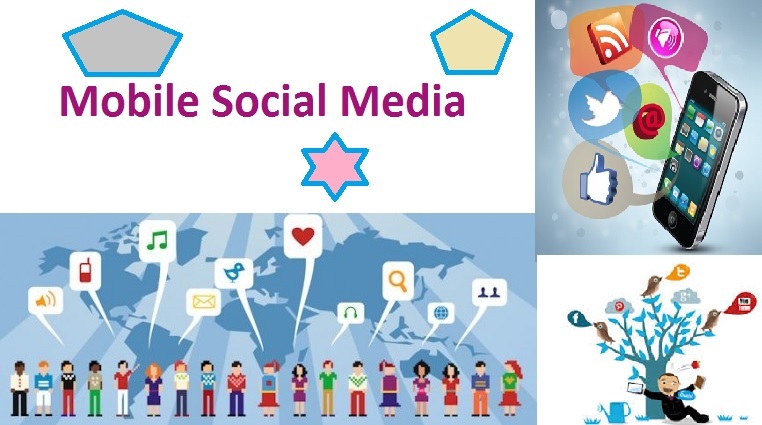 While traditional social media offers a variety of opportunities for companies in a wide range of business sectors. Mobile social media makes use of the location- and time-sensitivity aspects in order to engage in marketing research, communication, sales promotions/discounts, and relationship development/loyalty programs. Marketing research: Mobile social media applications offer data about offline consumer movements at a level of detail previously limited to online companies. Any firm can now know the exact time at which a customer entered one of its outlets, as well as comments made during the visit. Communication: Mobile social media communication takes two forms, the first of which is company-to-consumer in which a company may establish a connection to a consumer based on its location and provide reviews about locations nearby. Sales promotions and discounts: While in the past customers had to use printed coupons, mobile social media allows companies to tailor promotions to specific users at specific times. Relationship development and loyalty programs: In order to increase long-term relationships with customers, companies are able to create loyalty programs that allow customers who check-in regularly at a location to earn discounts. Business Marketing Analysts have stated that more consumers are accessing social media content today via mobile platforms, especially apps.